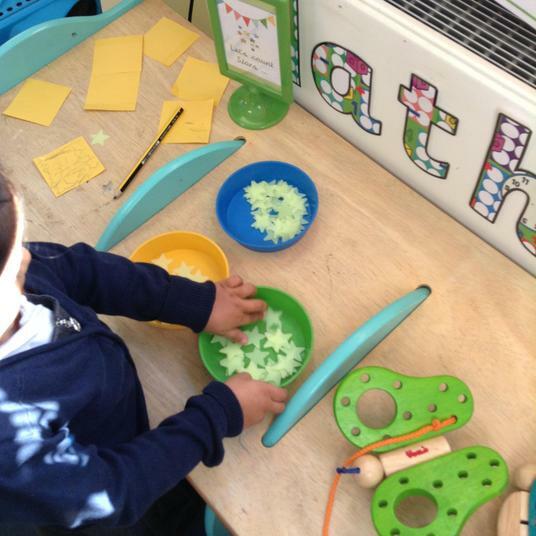 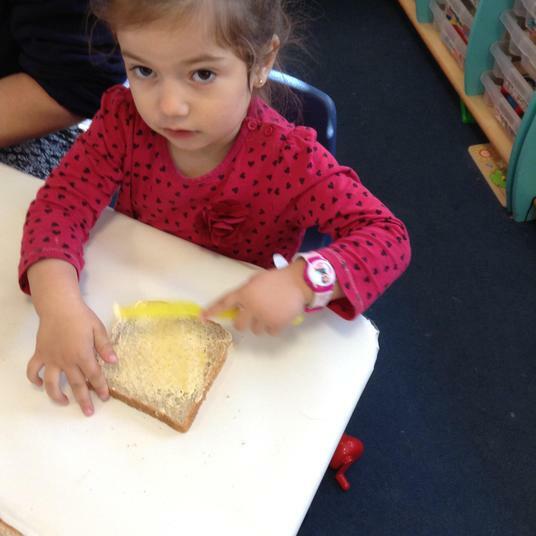 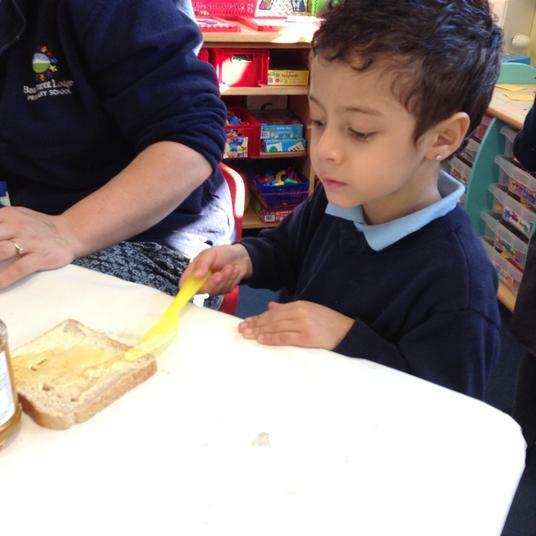 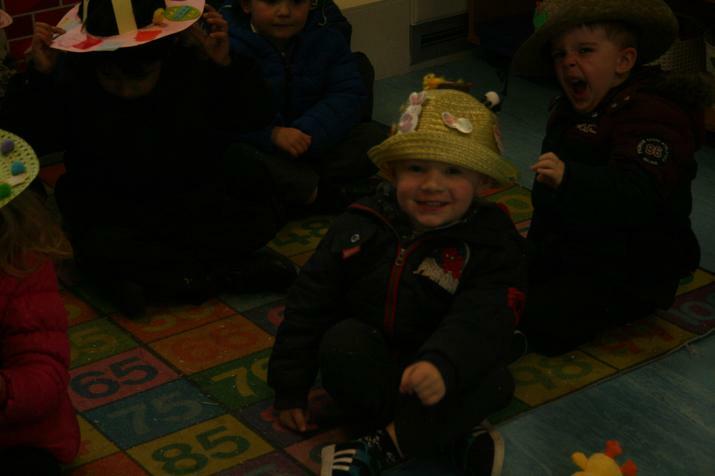 We have lots of fun at Nursery. 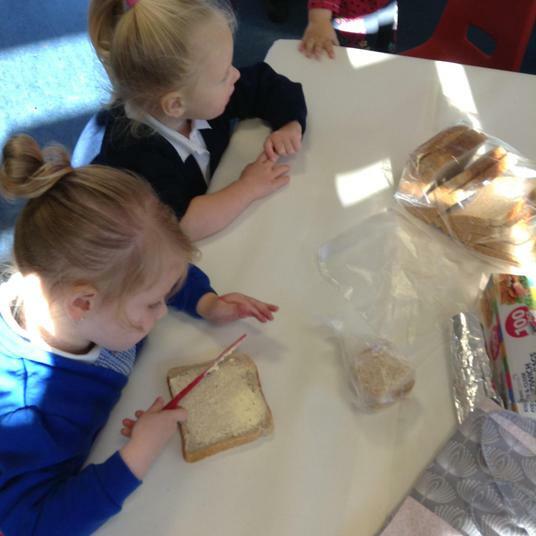 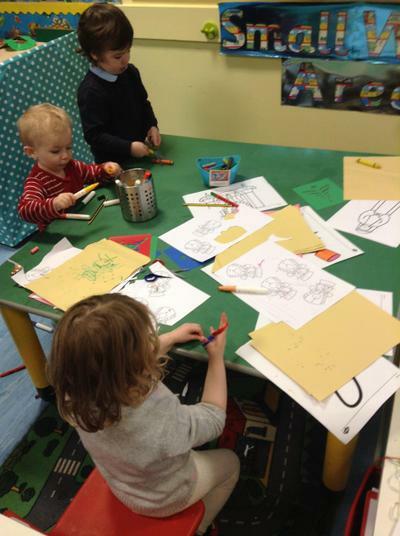 We have many exciting activities to do every week. 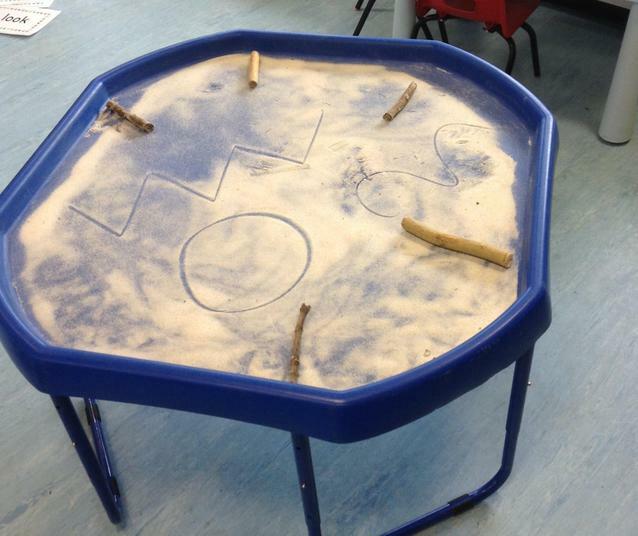 We enjoy playing in the sand, sticking, building, creating models, colouring pictures, small world, role-play, cooking and lots more. 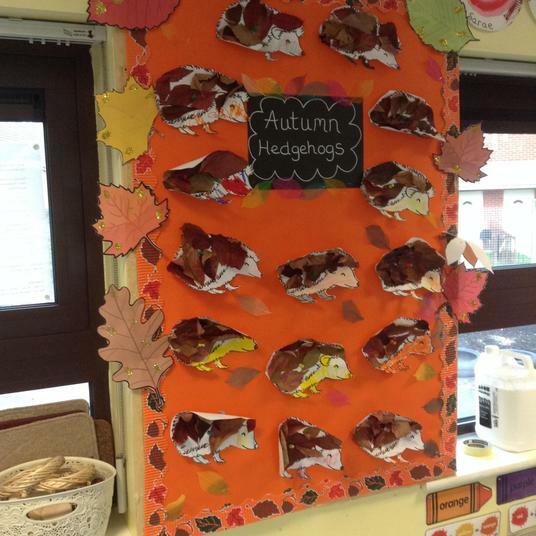 We have been singing counting songs, learning all about autumn (have you seen our Autumn Hedgehog display?) 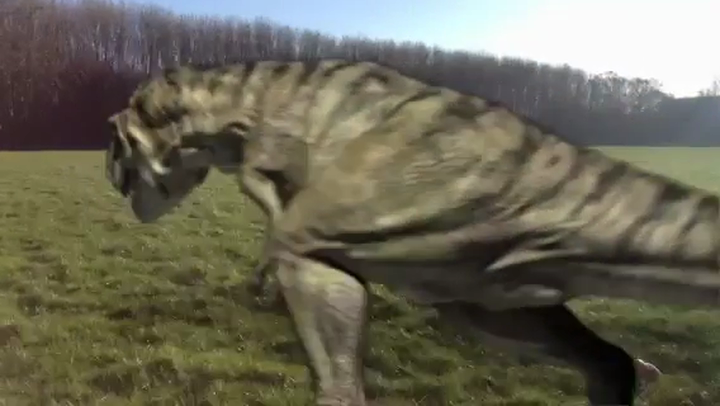 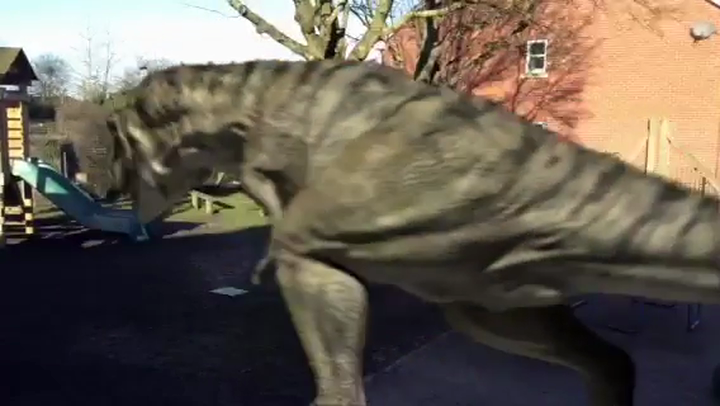 and listening to sounds in the environment. 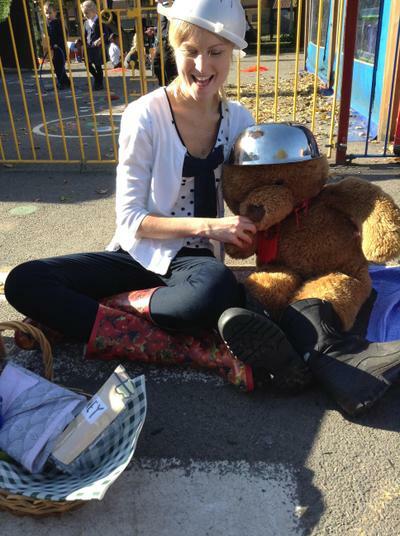 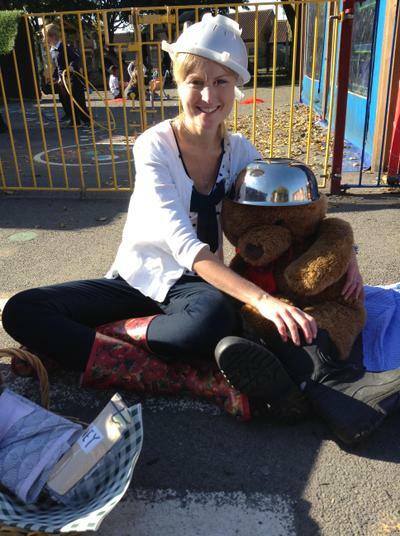 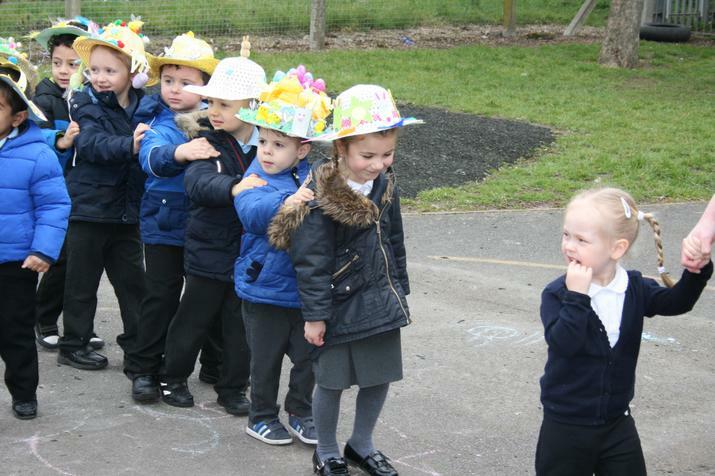 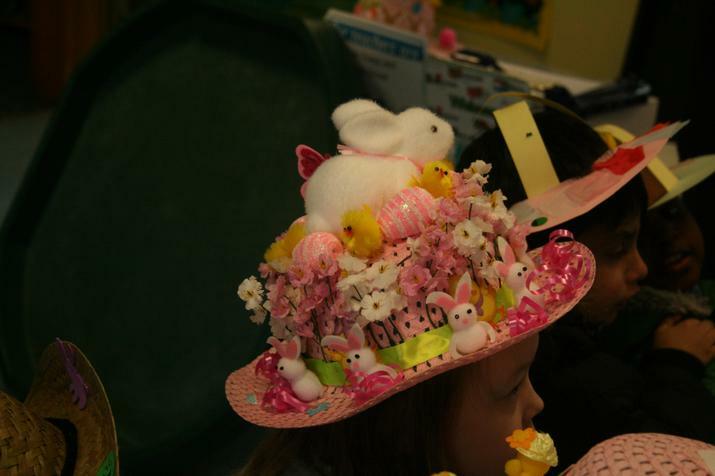 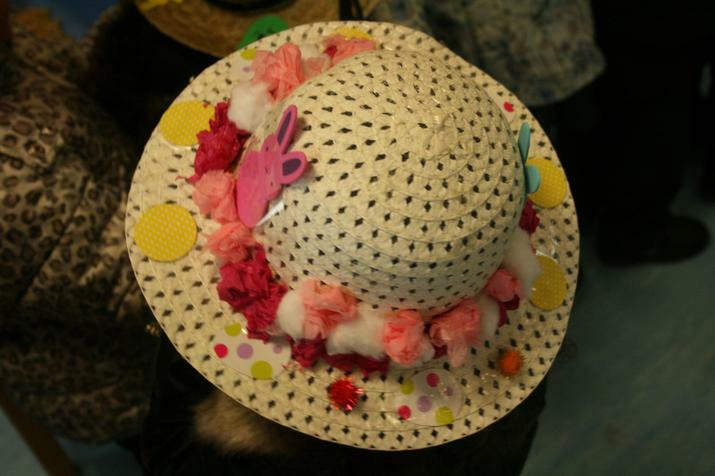 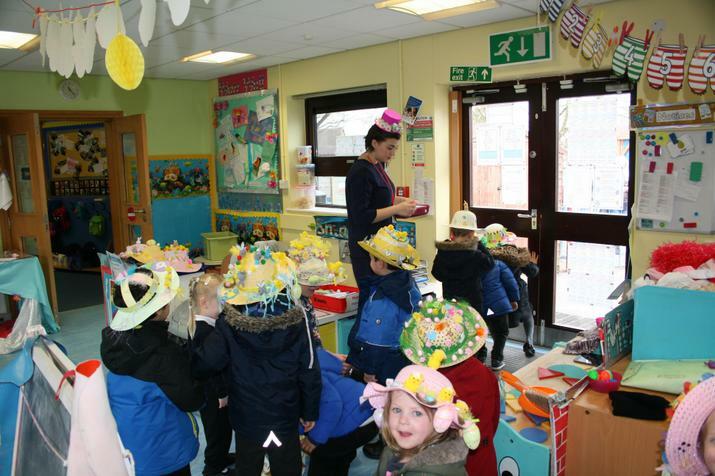 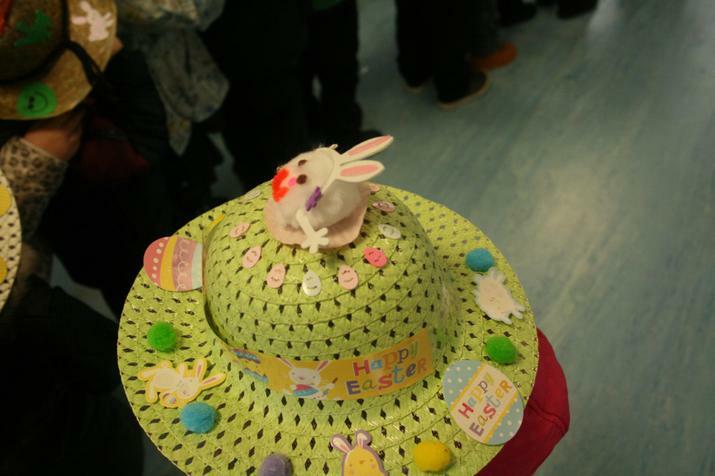 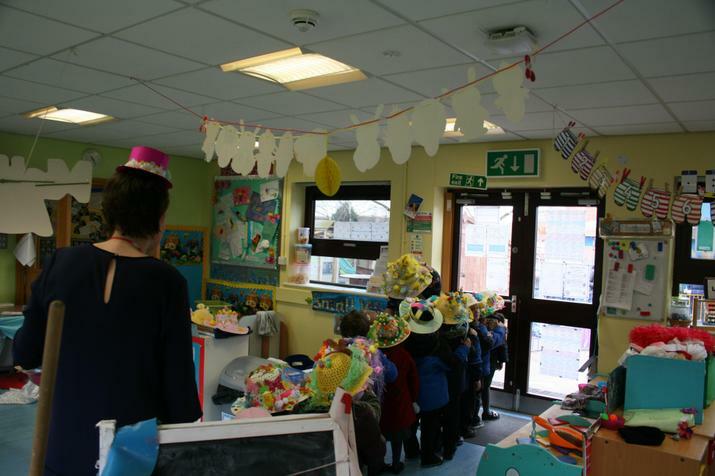 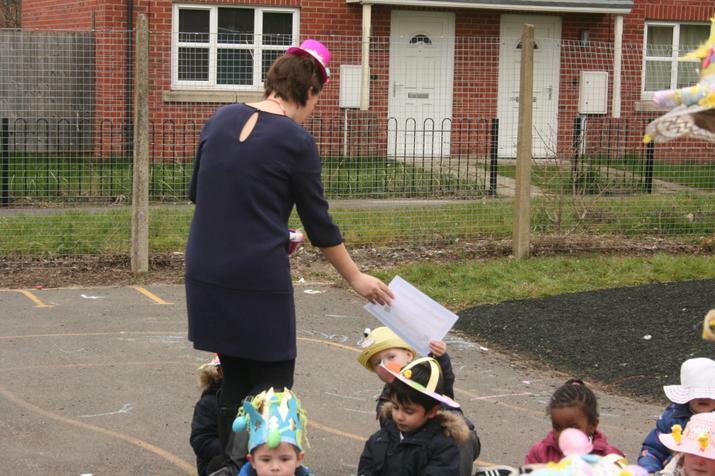 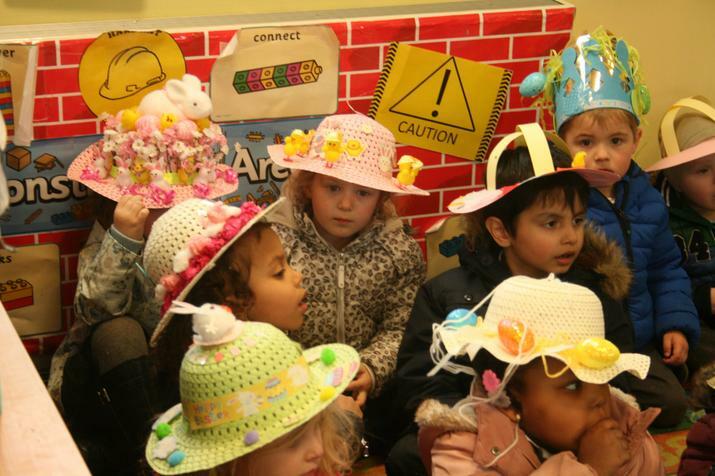 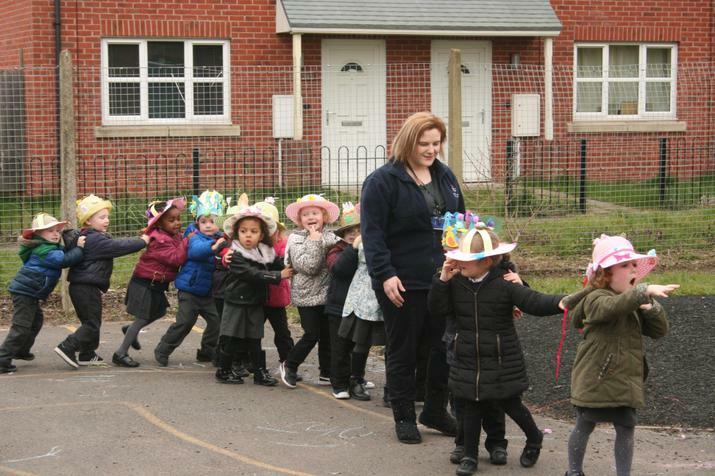 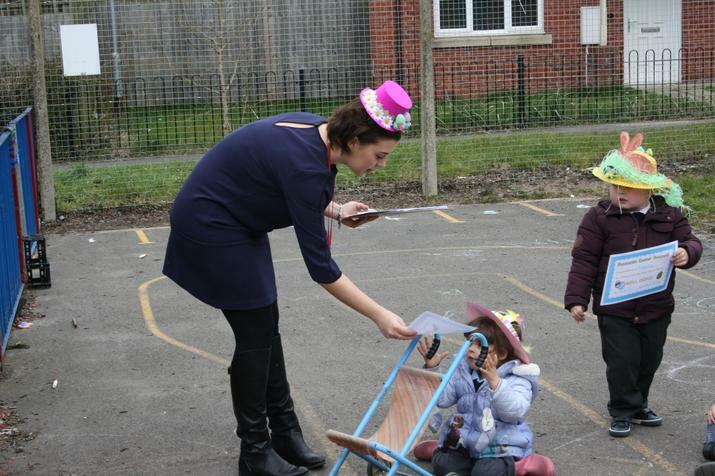 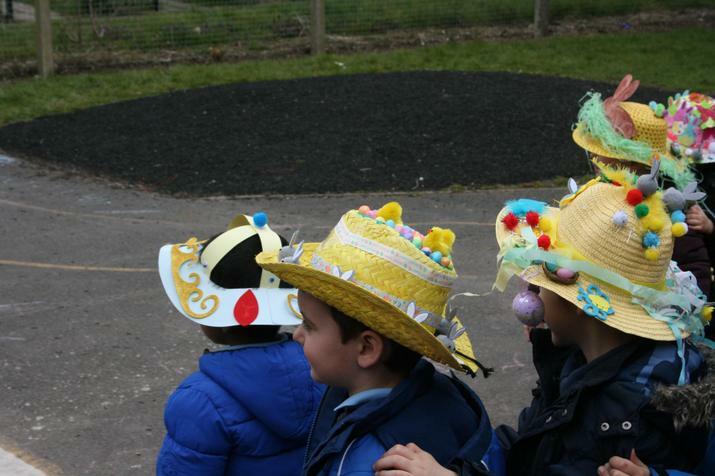 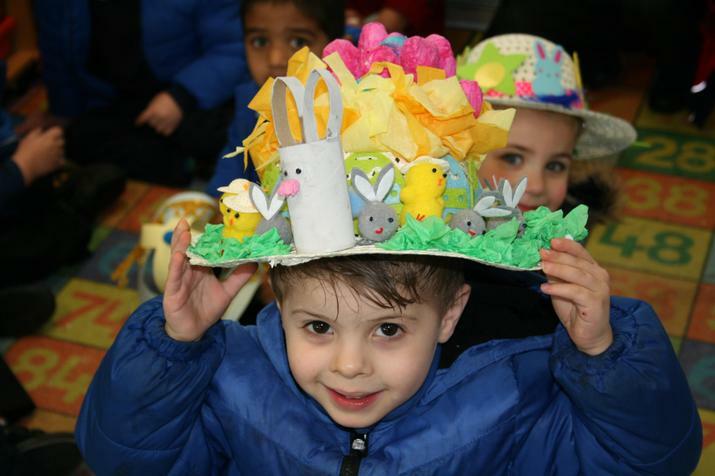 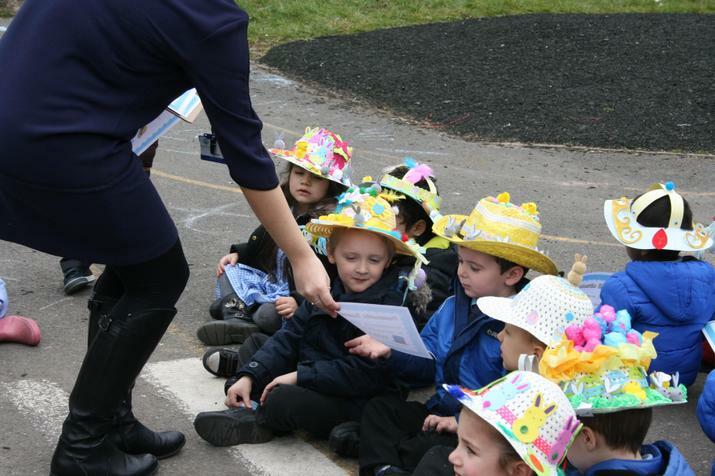 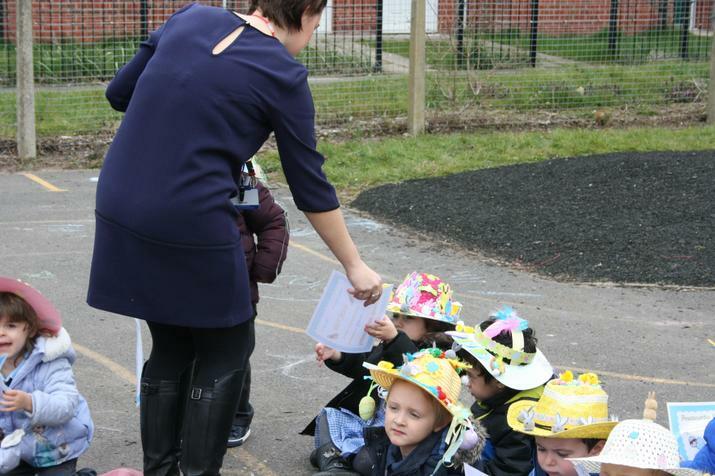 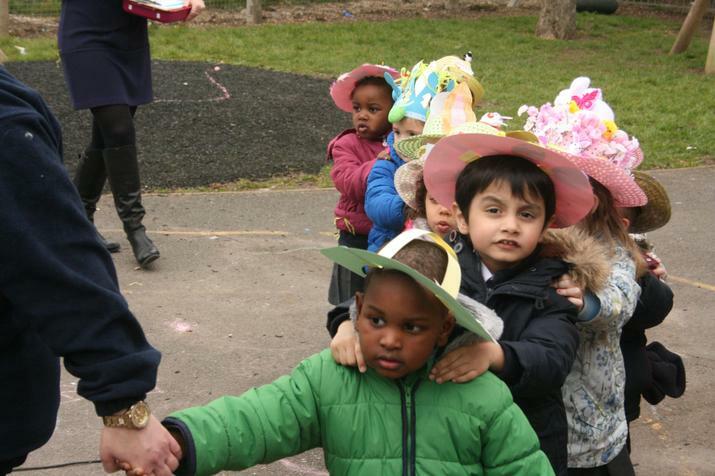 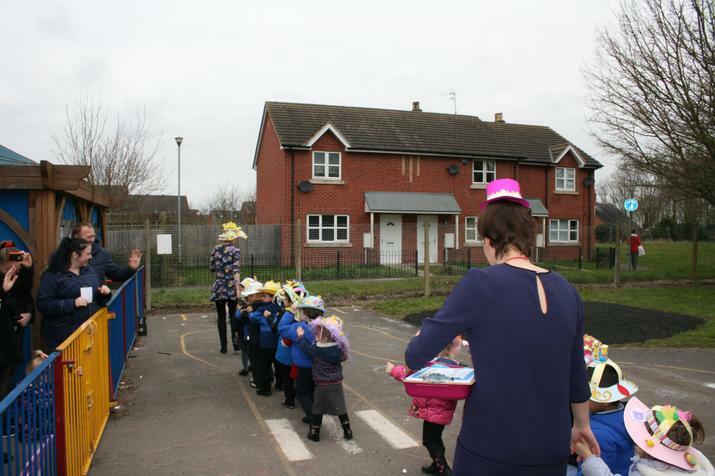 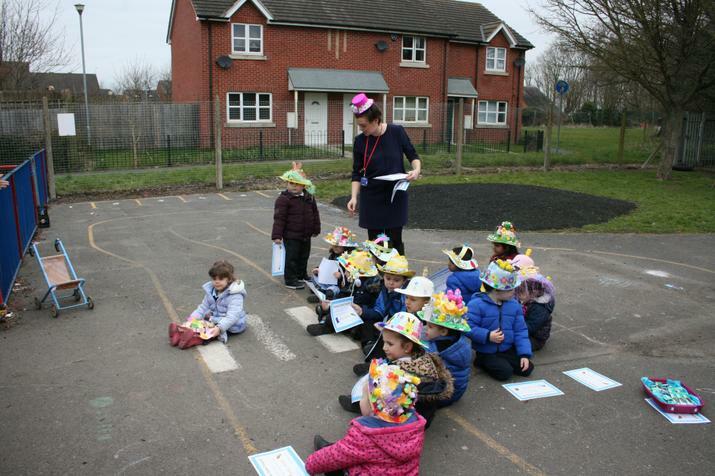 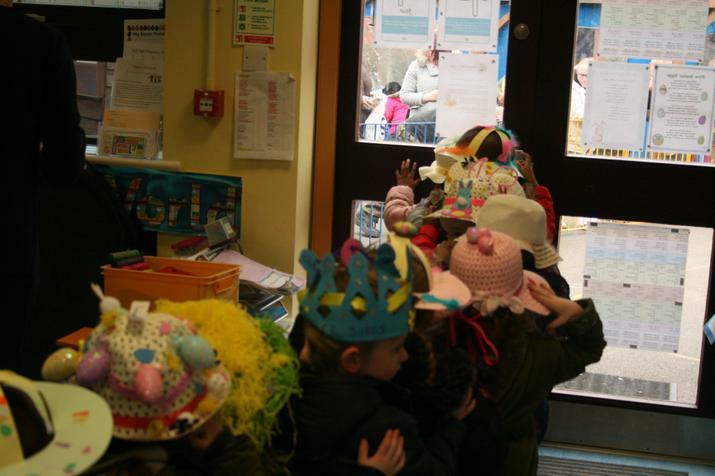 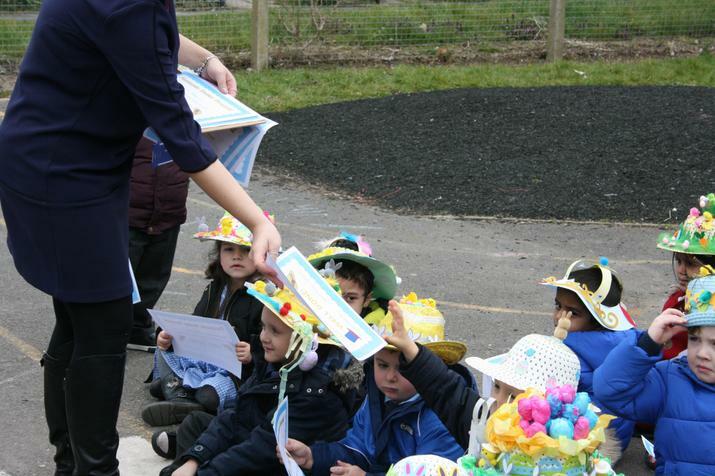 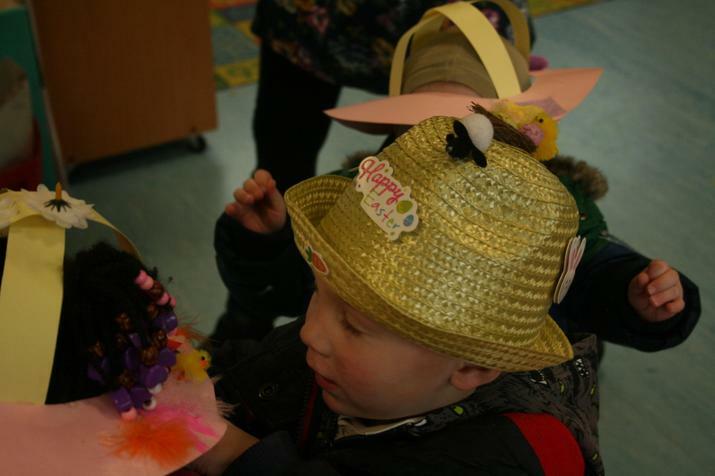 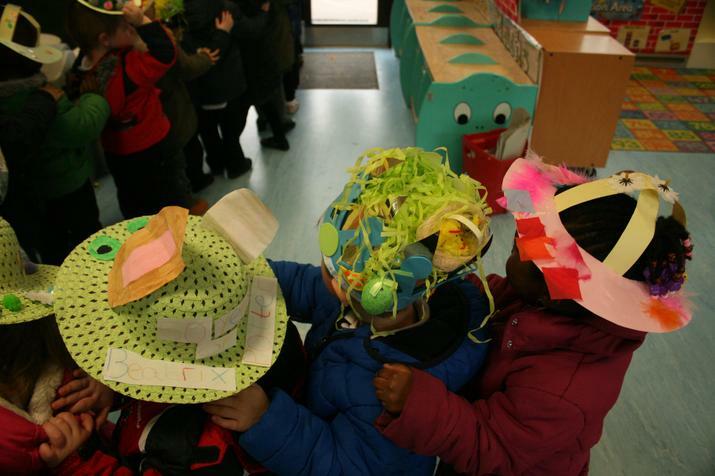 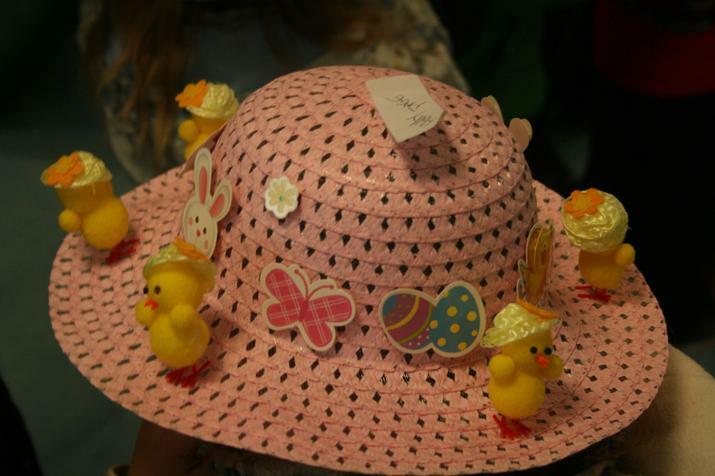 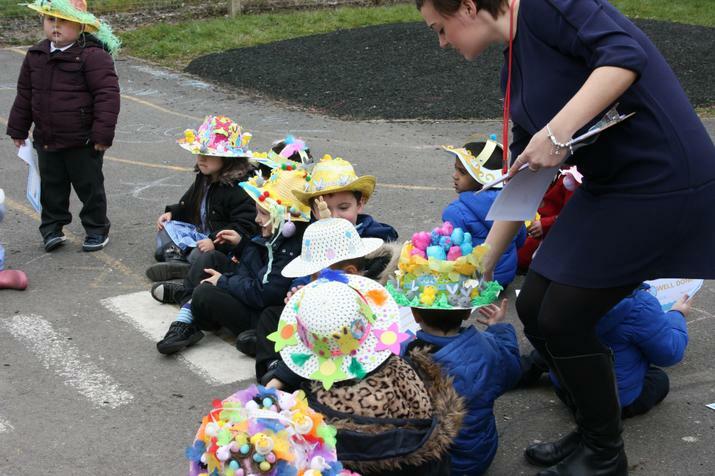 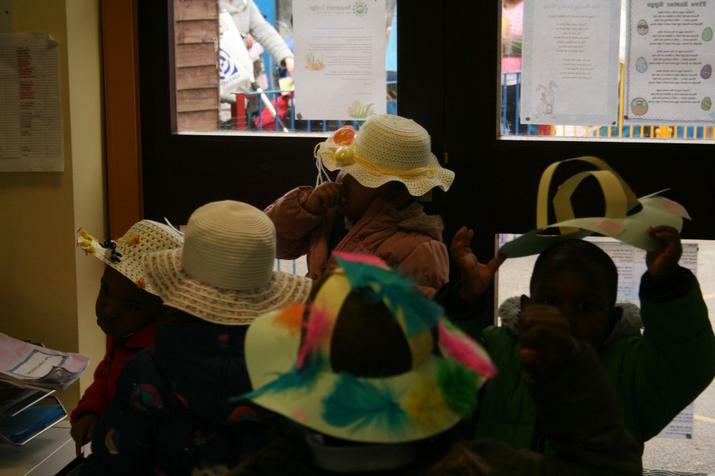 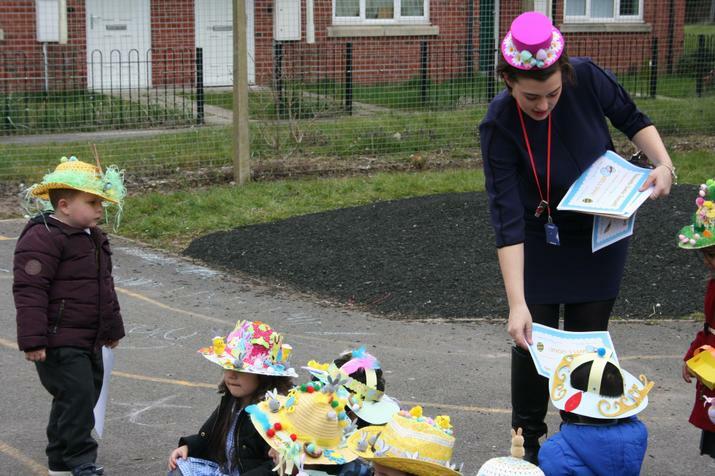 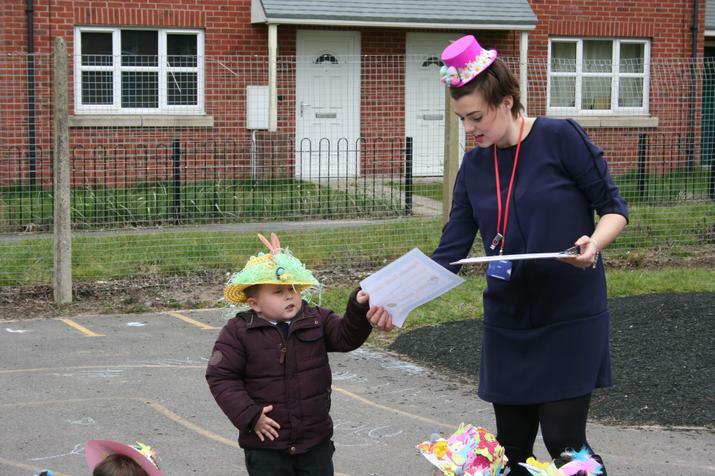 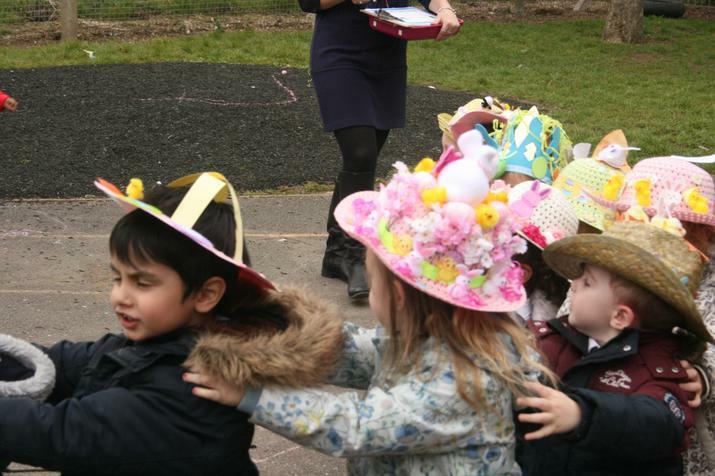 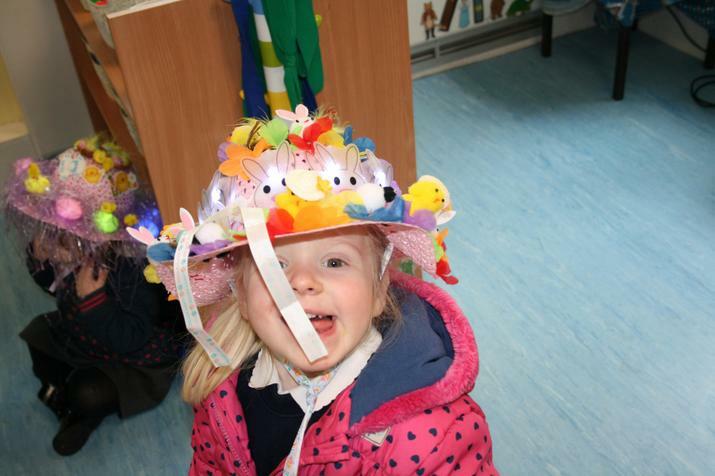 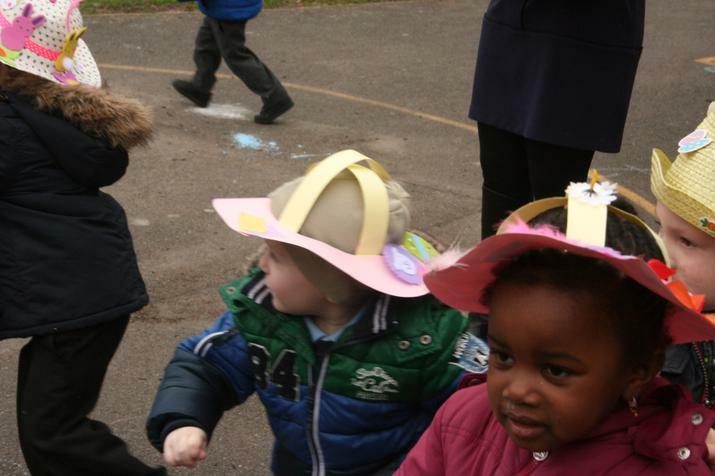 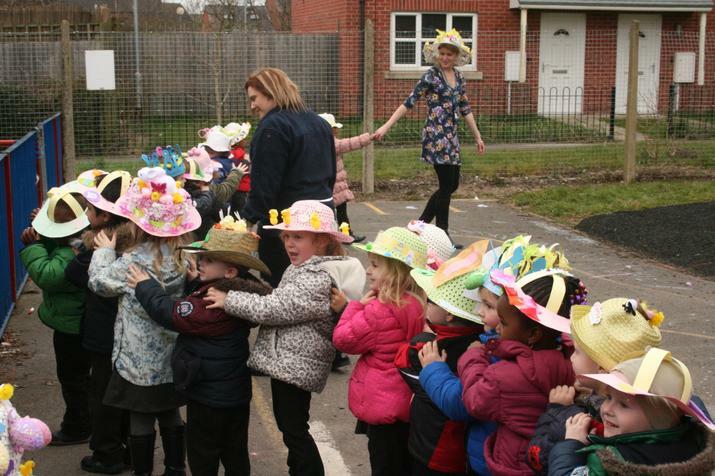 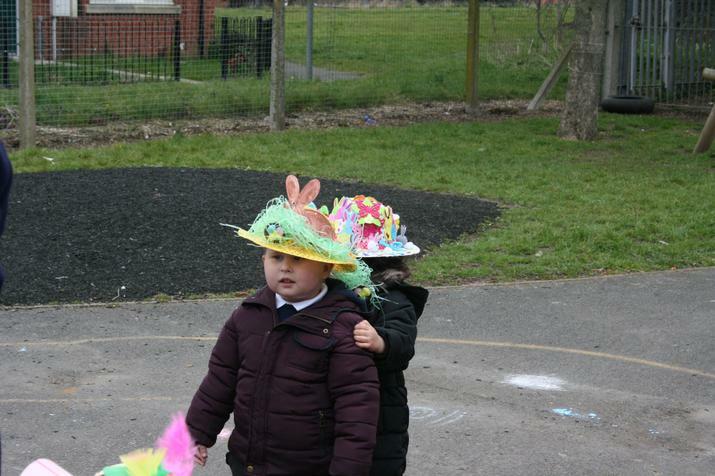 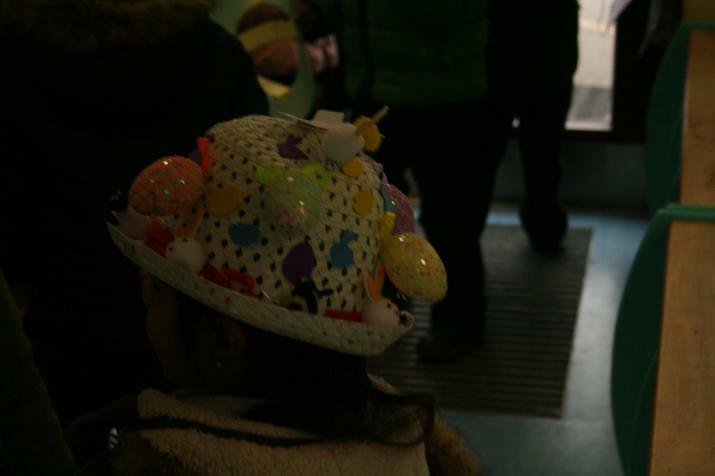 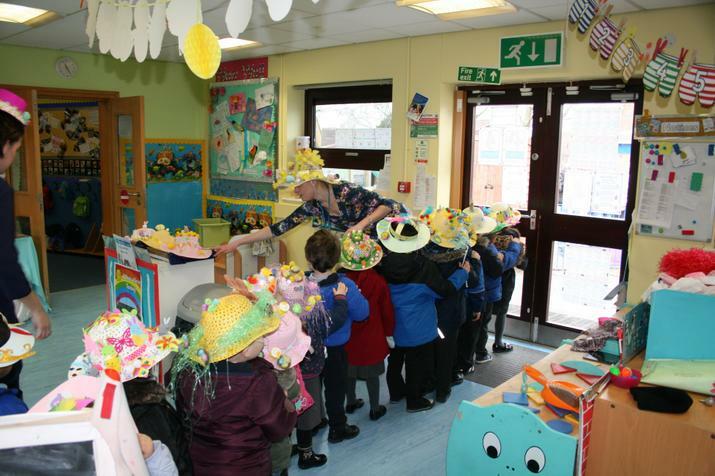 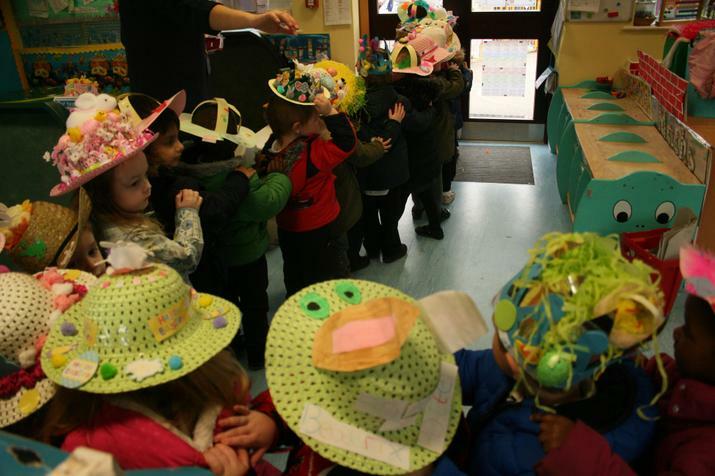 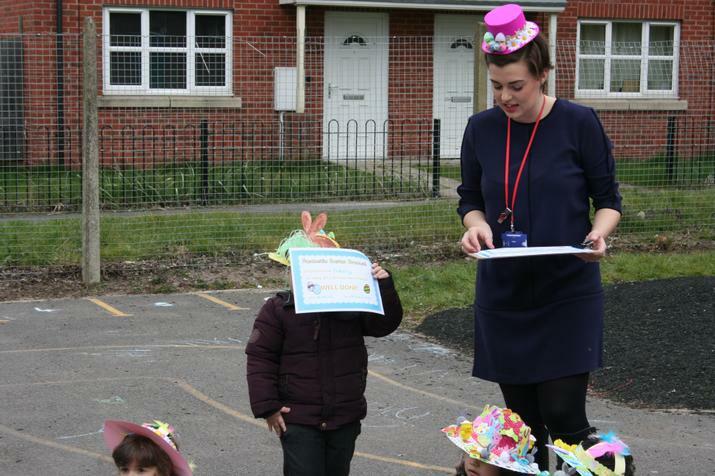 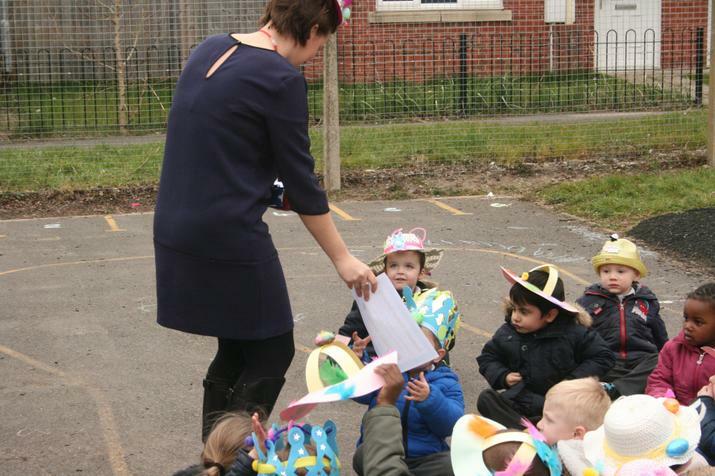 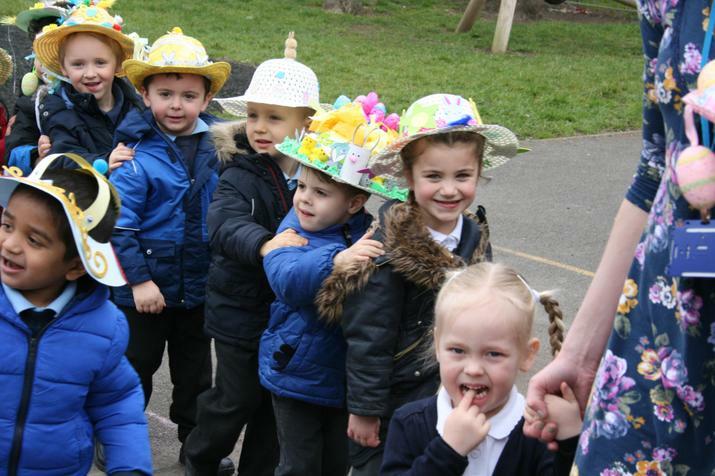 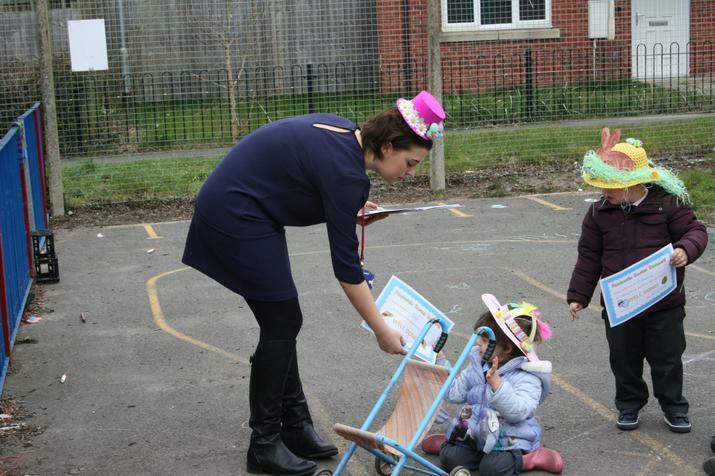 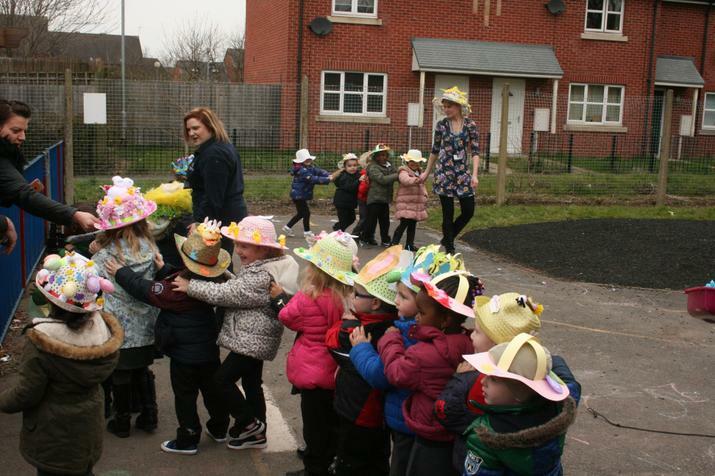 Nursery children had the opportunity to show off their Easter bonnets during a parade around the playground! 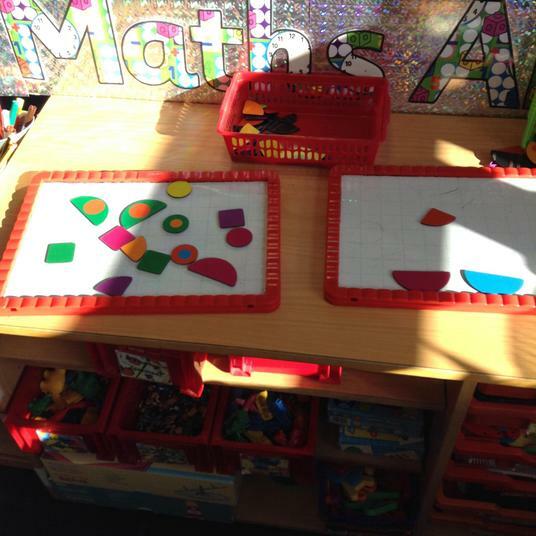 You can see some of the images below! 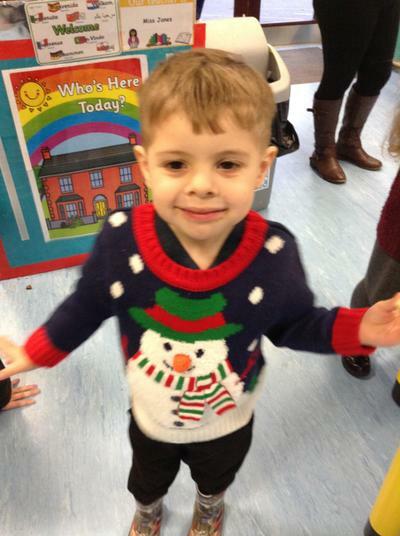 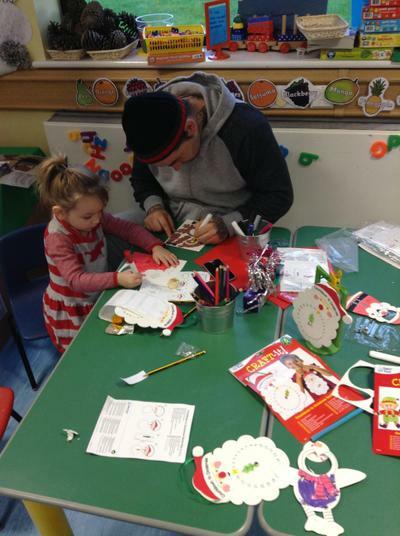 Nursery had a great time enjoying the Christmas Crafts – we listened to Christmas music, coloured Christmas pictures, decorated wreaths and Christmas Trees, decorated our own baubles to hang on the tree, made stocking cards, made a snowman countdown to Christmas decoration and a split pin Christmas character photo frame and some of our parents even chose to put their sewing skills to the test by helping their child to make a snowman decoration to hang on the Christmas Tree (Miss Jones struggled to even thread the needle so Graces’ Mummy came to the rescue!! 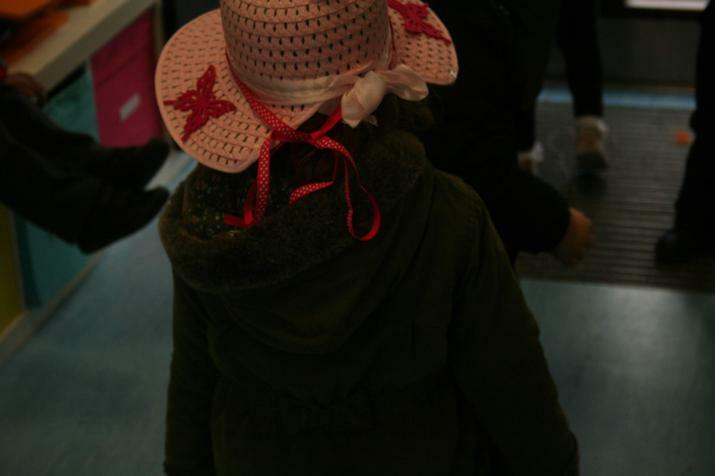 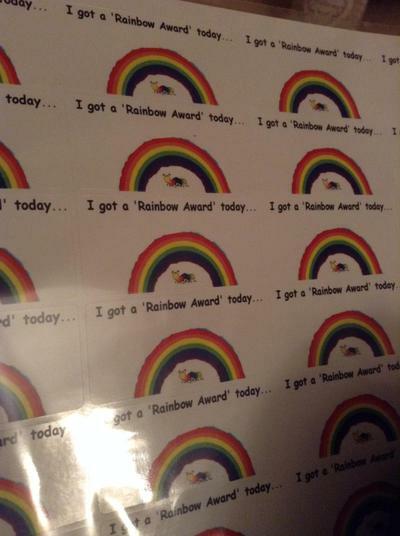 Thank you!!). 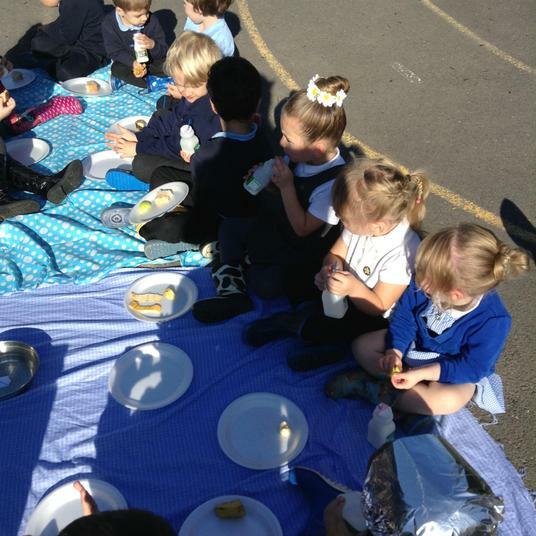 We enjoyed the chocolate biscuits!! 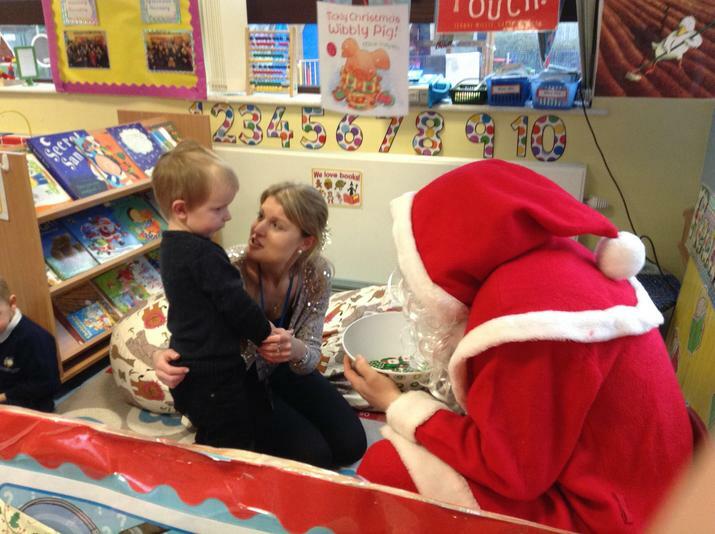 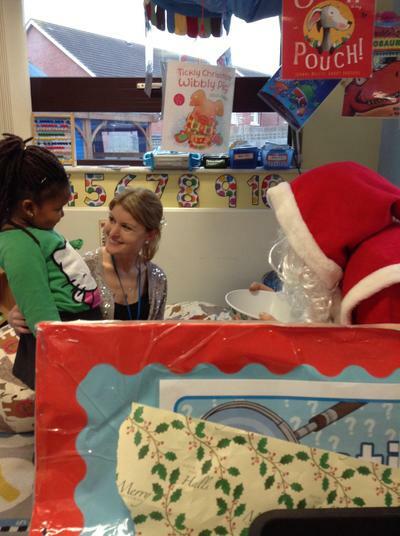 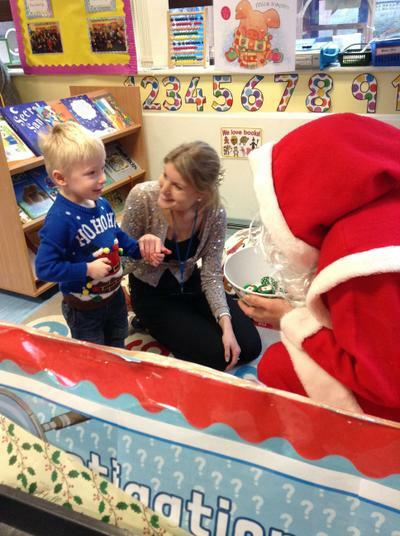 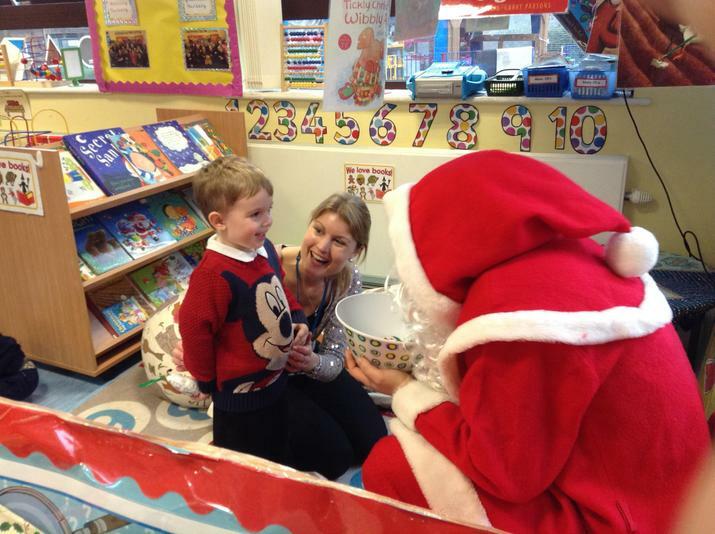 We even had a special surprise visit from Santa Clause!!! 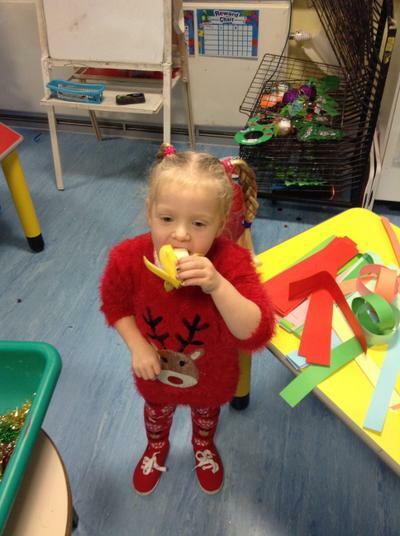 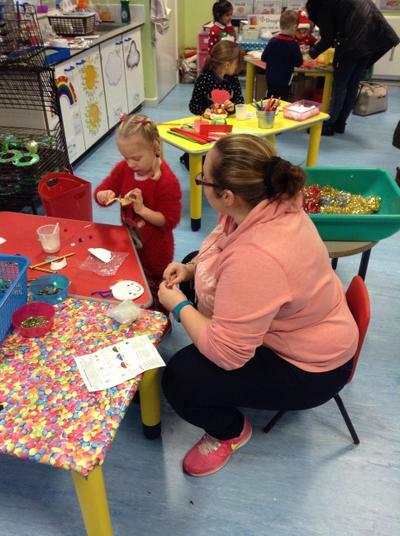 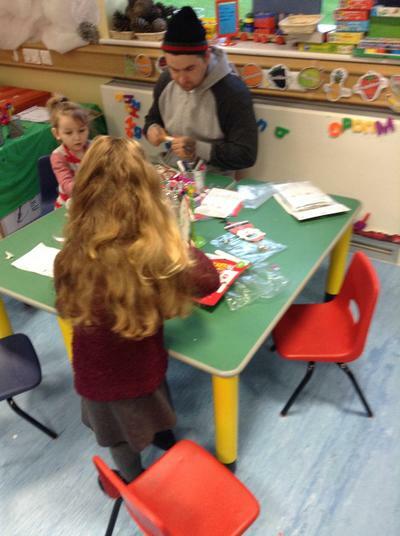 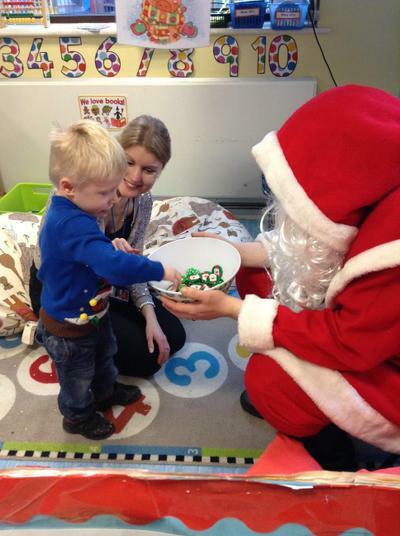 A big thank you to all those parents who attended our Christmas Craft Session. 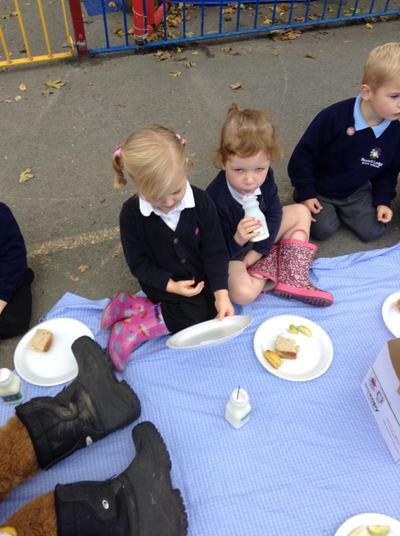 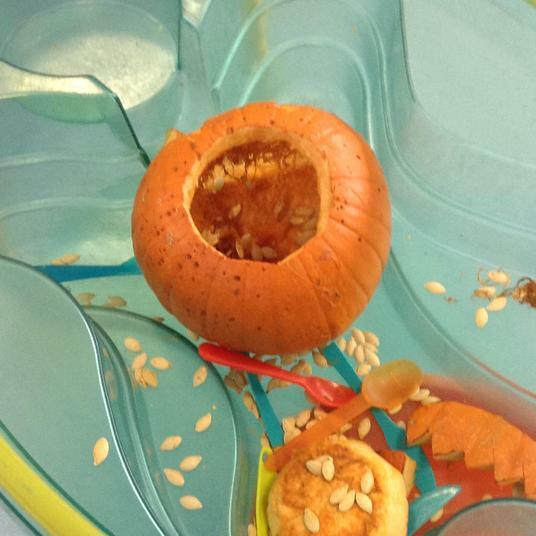 The Nursery children have had fun learning about Autumn. 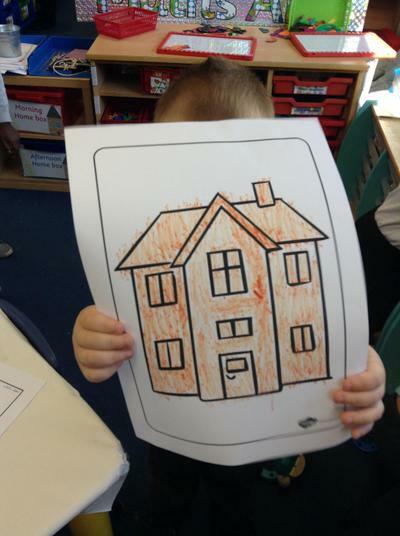 Some children have extended their interest in our topic to produce some great pictures over half term. 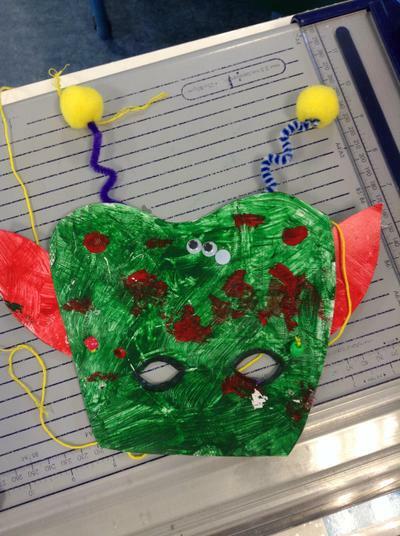 Mikel used various materials to make this super 3D collage of a scarecrow. 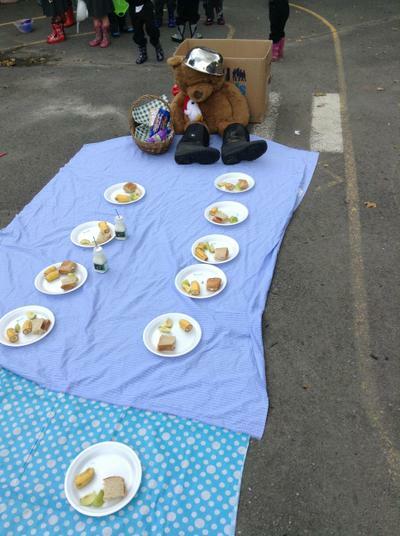 We were impressed by Mikel's creativity. 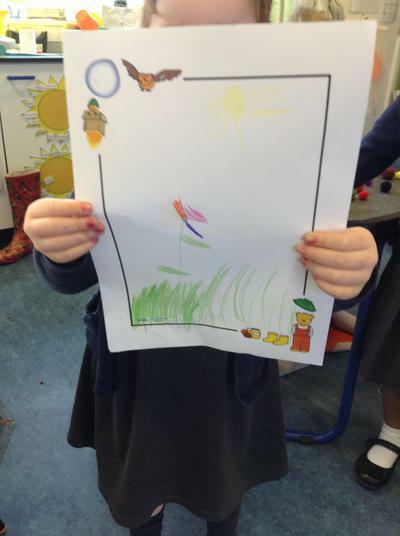 Anushka created a lovely Autumn collage; set in a farmers field. 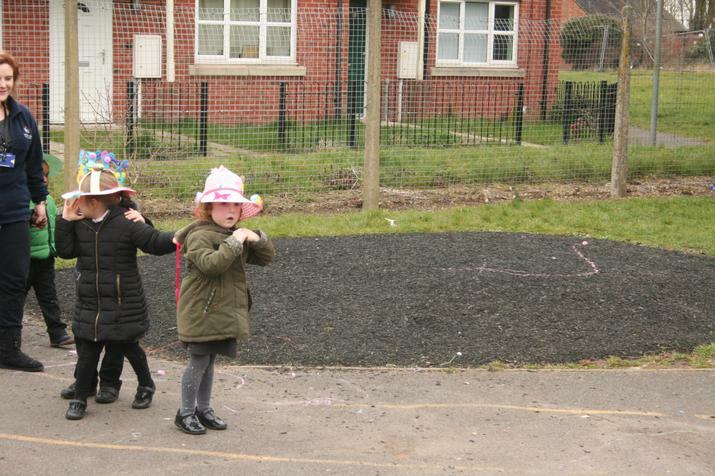 She included a scarecrow and a tractor ploughing the field (using rice to represent the crop). 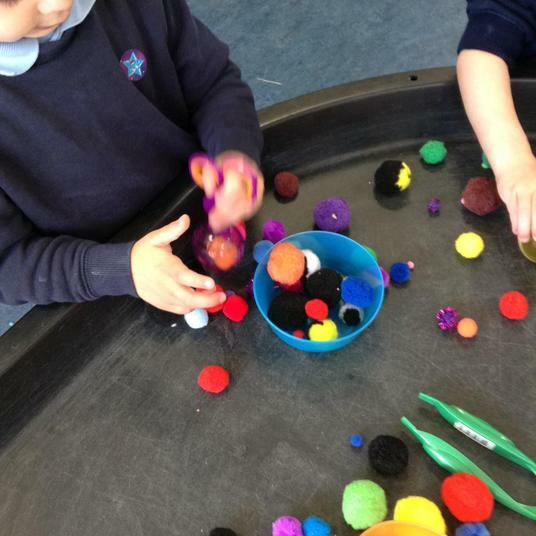 We love the cotton wool, which Anushka used to form the clouds. 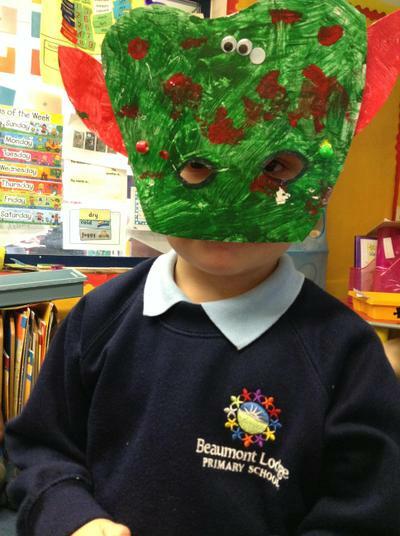 Well done for experimenting with a range of media to create an eye-catching piece of work. 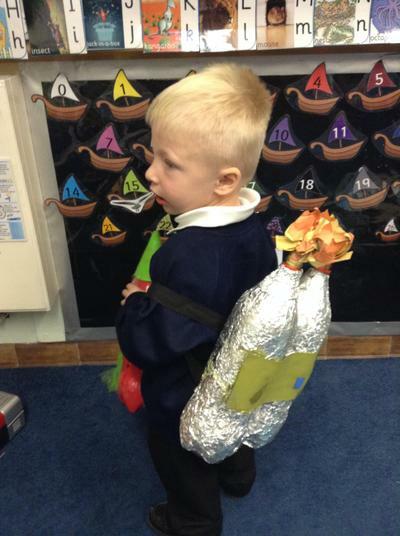 Liam has been busy making a scarecrow collage using a range of different materials. 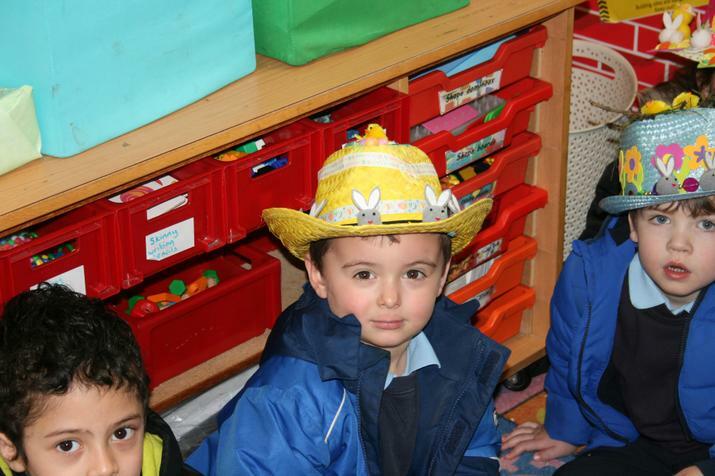 Liam pointed out the buttons, hat and straw, which he used. 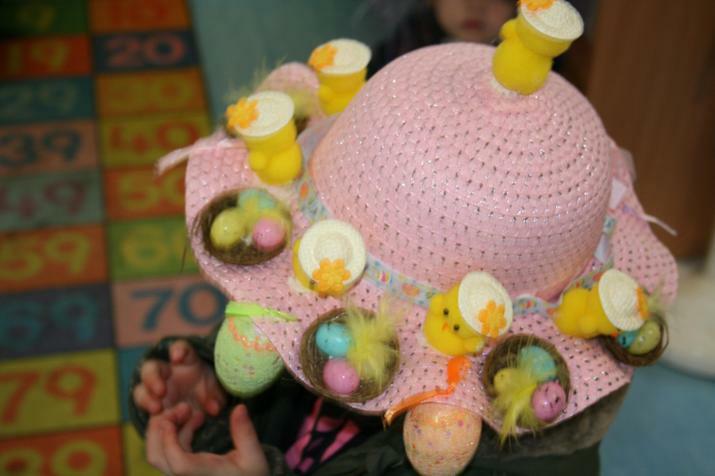 What a great idea using real straw it is very effective. 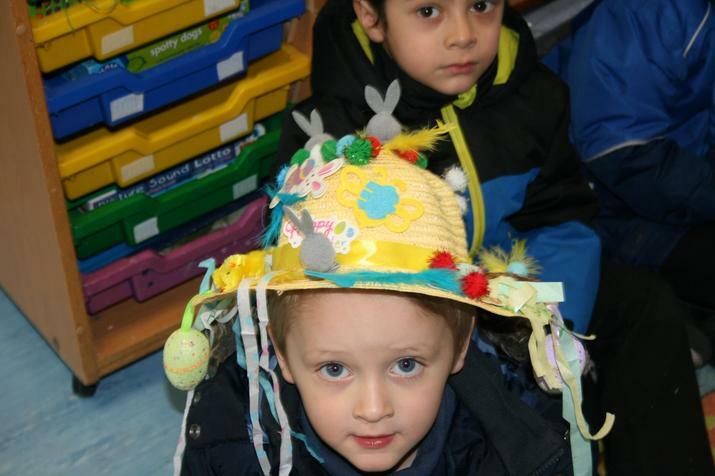 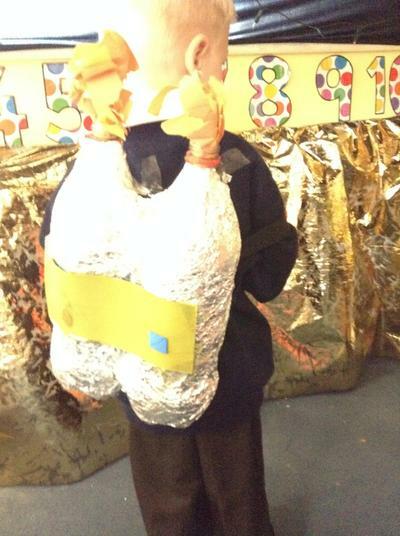 We also love the feather on the scarecrows hat. 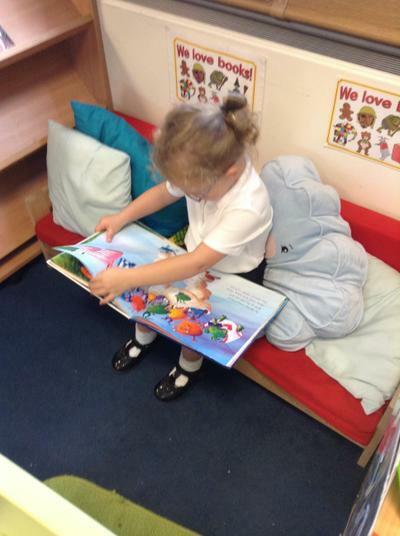 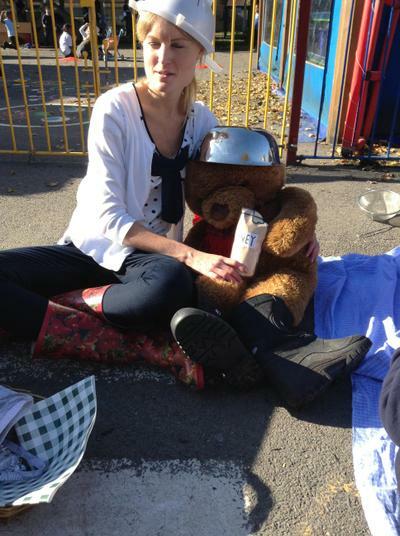 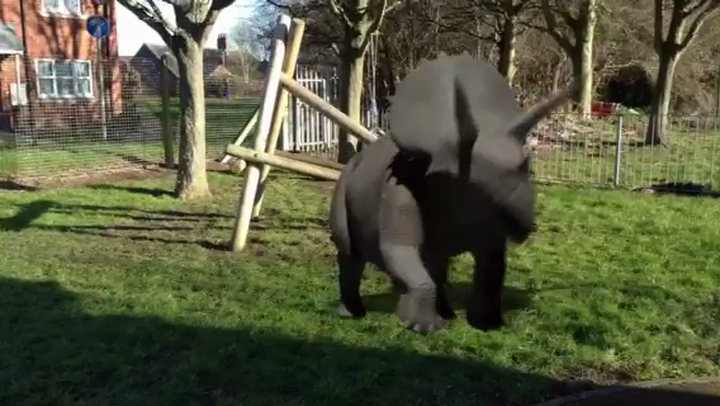 Grace was keen to share her half term adventure with us all! 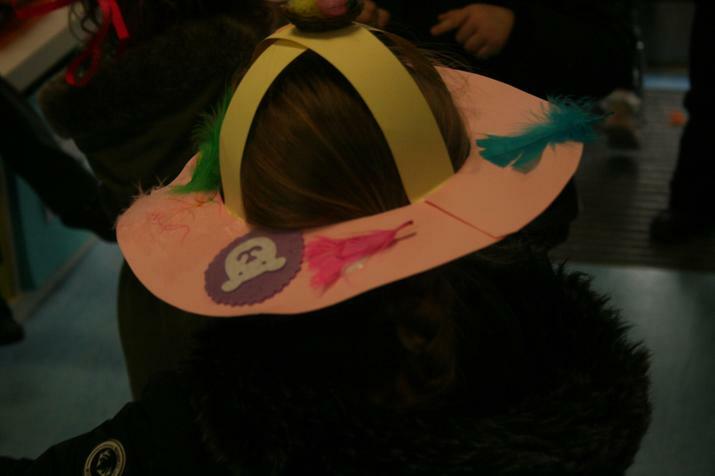 Grace was lucky enough to go on a plane (for the first time) to Lloret De Mar in Spain and even learned some Spanish! 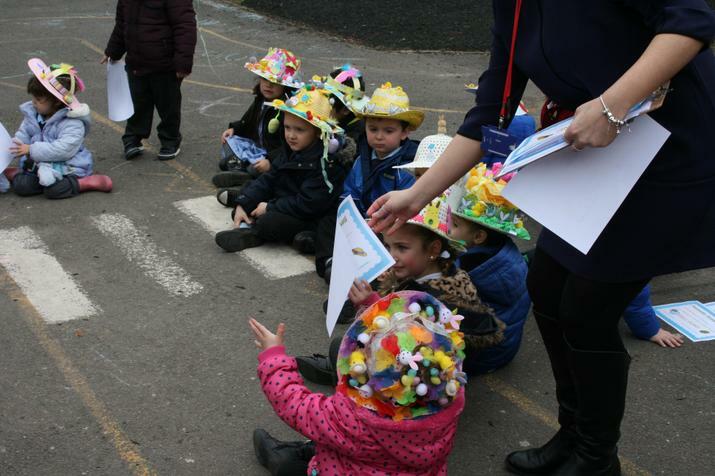 She impressed us either her Spanish lingo 'Halo' (Hello) announced Grace. 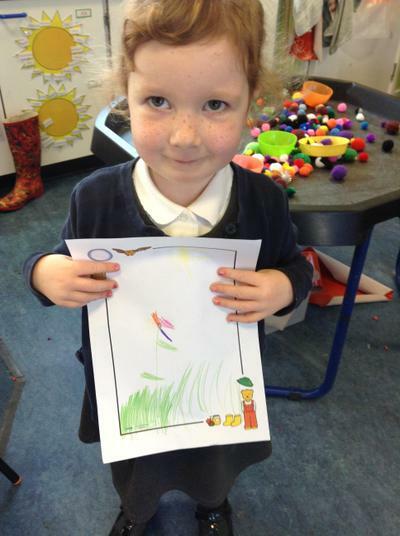 Grace has also been making an Autumn Collage from natural materials. 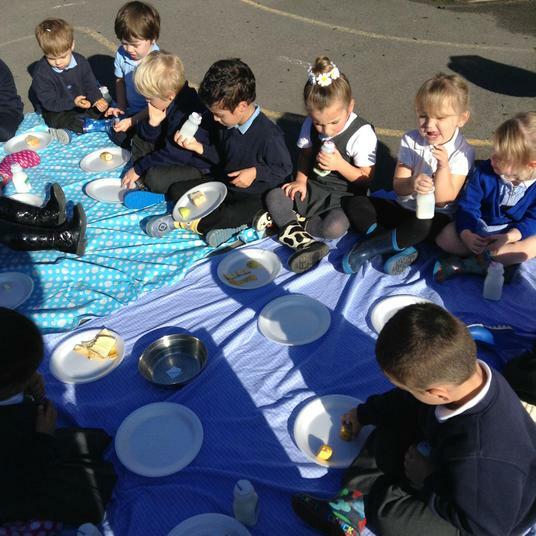 Well done to these children for sharing their home learning with us all. 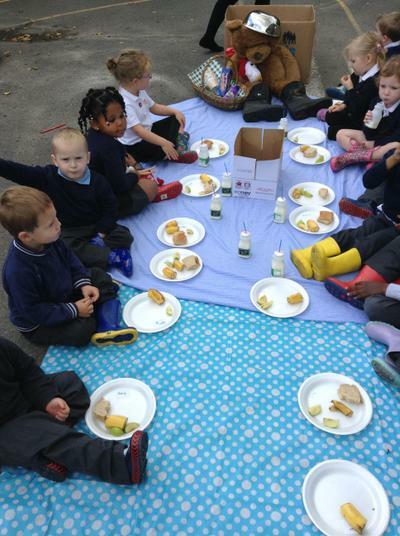 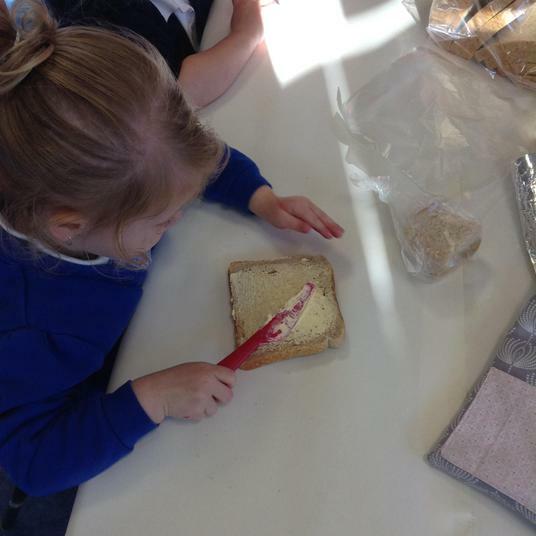 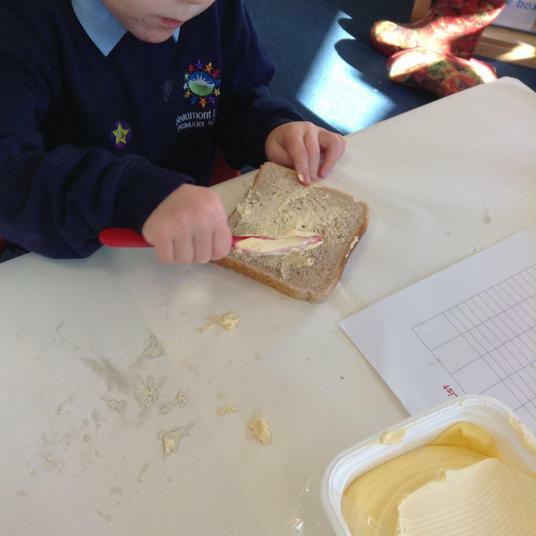 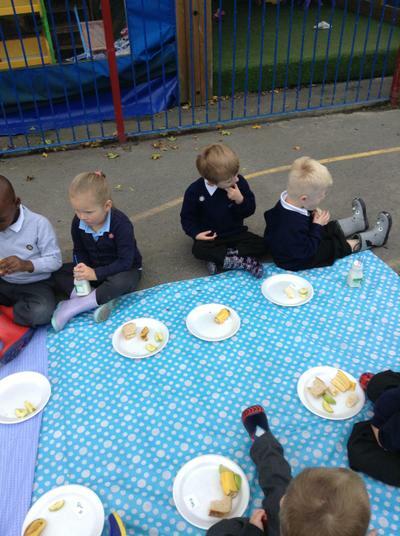 Please continue to share any news/home learning (name writing, pictures, writing/mark making, models, pictures of baking goods made, books shared at home, talking about places visited etc) with us every Friday. 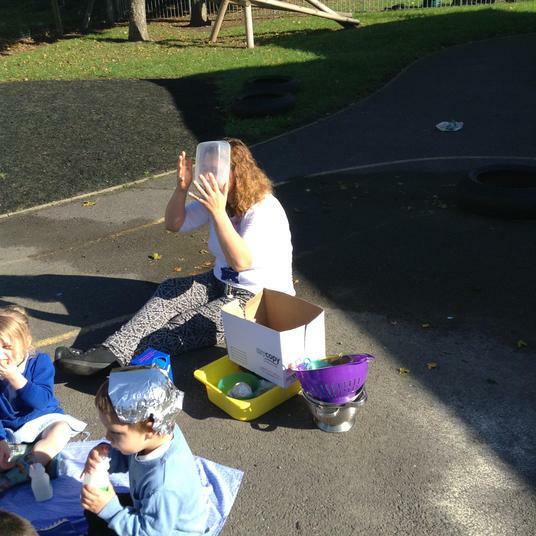 In Nursery, we have been learning all about Space through reading the book ‘Aliens Love Underpants’ and ‘Whatever Next’. 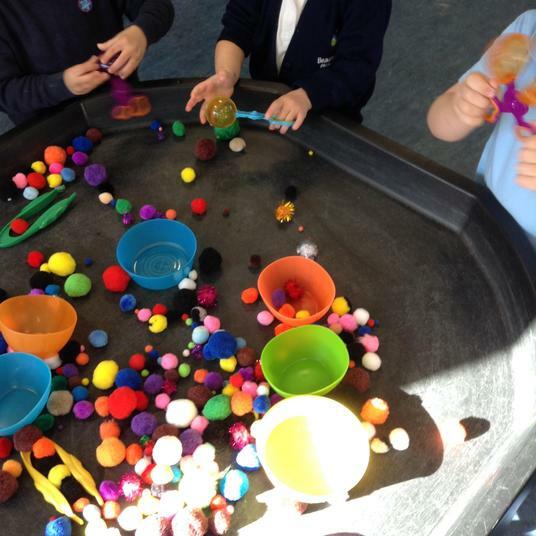 Look at some of the amazing things that we have made at home to do with our topic! 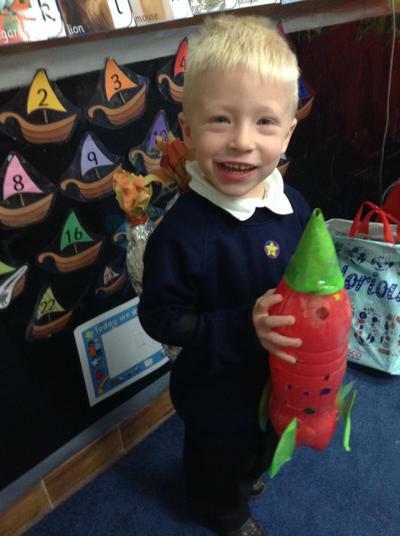 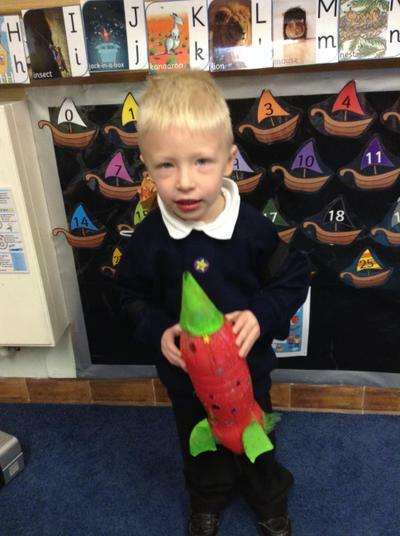 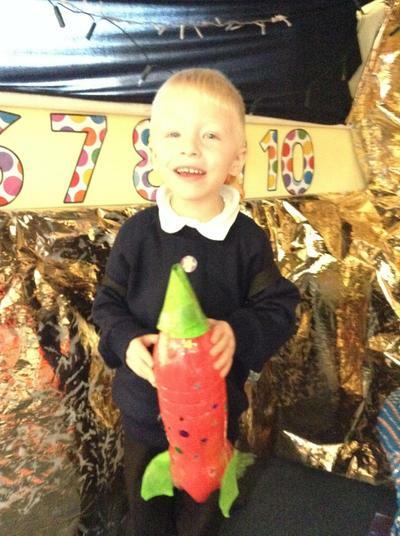 Jakub used brightly coloured plasticine to cover a bottle to make his Rocket. 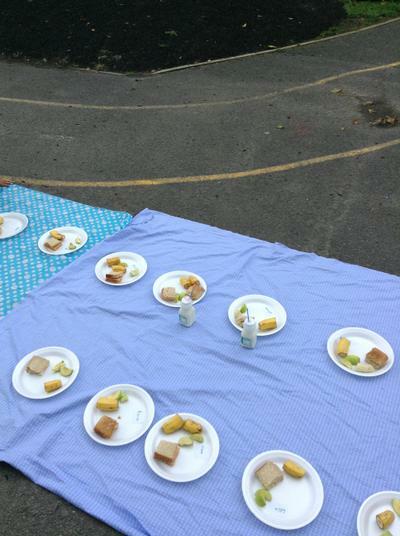 Wow what a great idea – we love this colourful design! 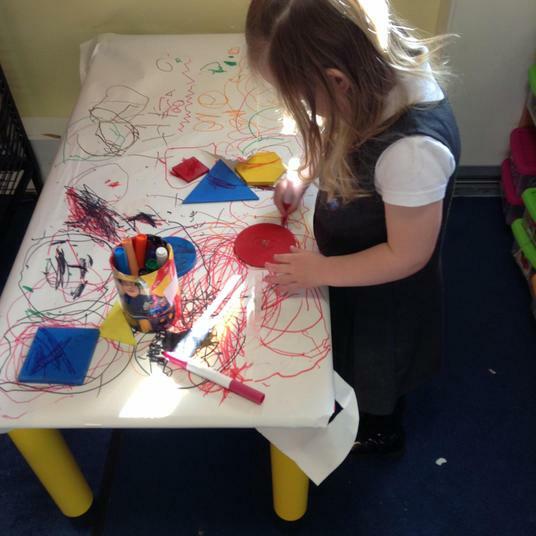 We loved Avas’s design on her Rocket, she used various types of materials to make it colourful. 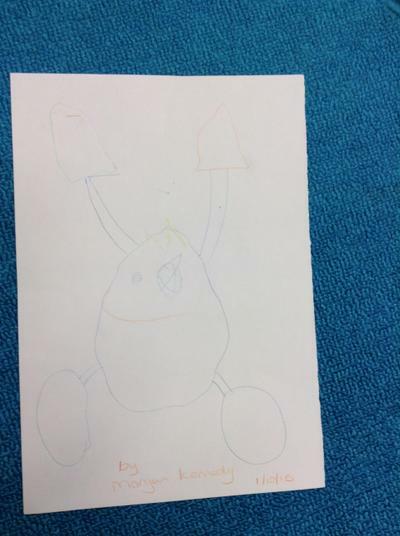 Nathan drew a lovely picture of his family and was able to name the family members. 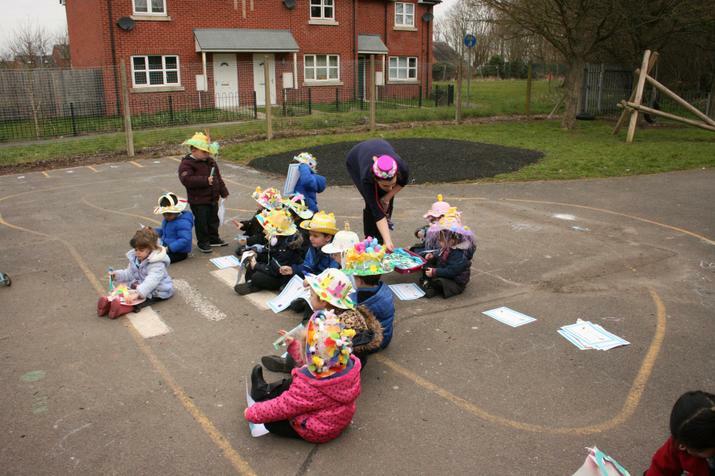 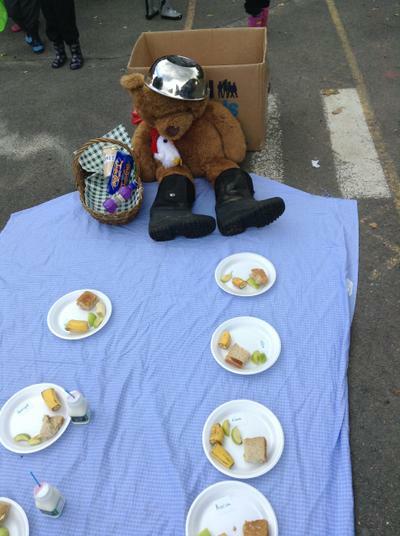 Photos from our 'Space Adventure' based on the book 'Whatever Next' by Jill Murphy. 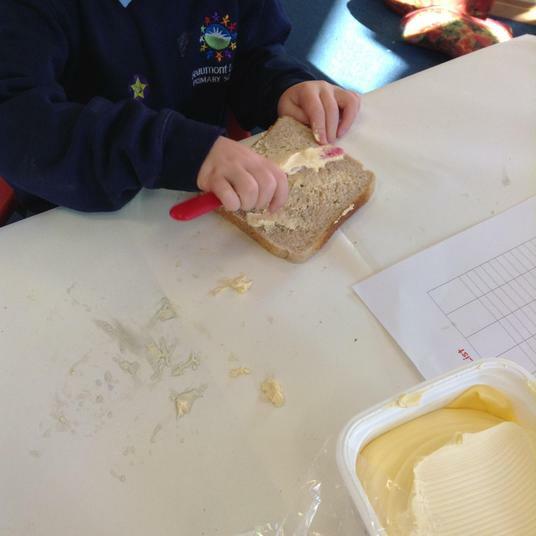 Well done Kian - you have been working very hard. 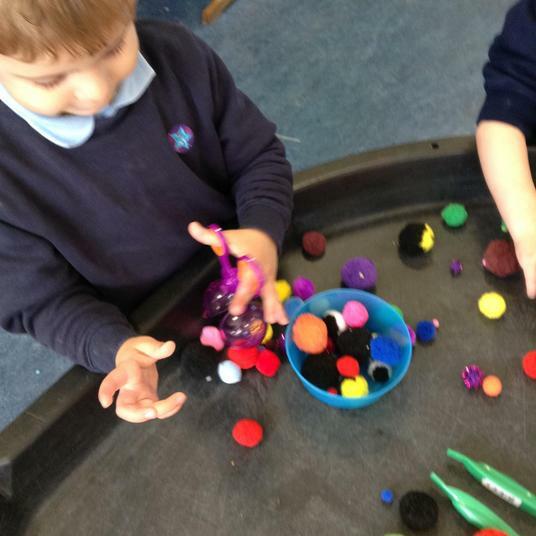 Jake was kind enough to share his Space Story book with us-we had fun reading it and looking at the pictures. 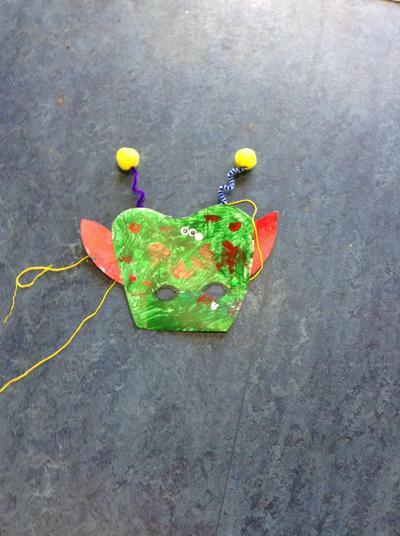 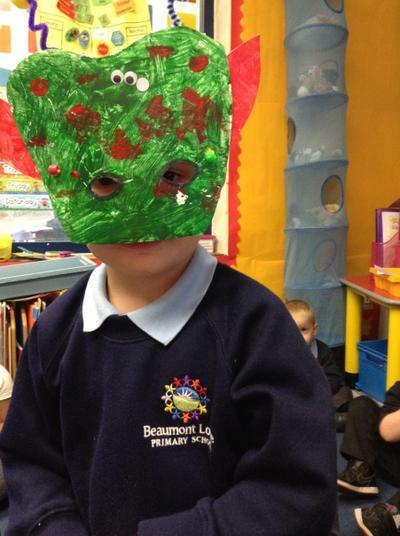 Liam has been busy making a Spectacular Spaceship and an Amazing Alien Mask complete with Antenna’s and Googly eyes! 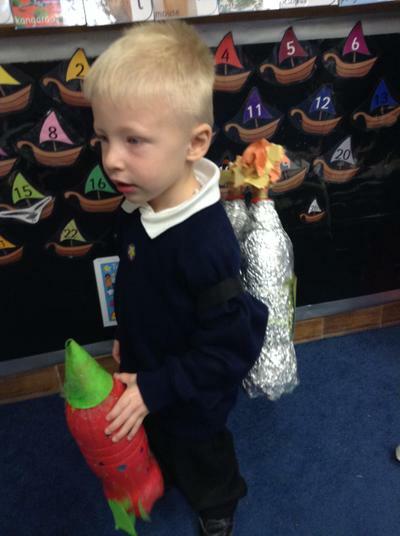 Kimberley blasted off our ‘Show and Tell’ session with her impressive Rocket. 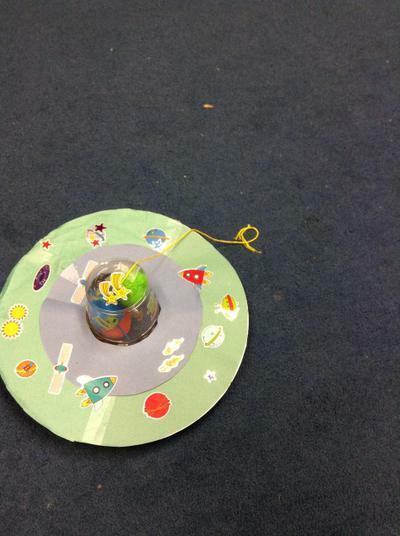 Anushka shared her Pictures about her Trip to the Space Centre in Leicester – she had lots of fun learning about Space. 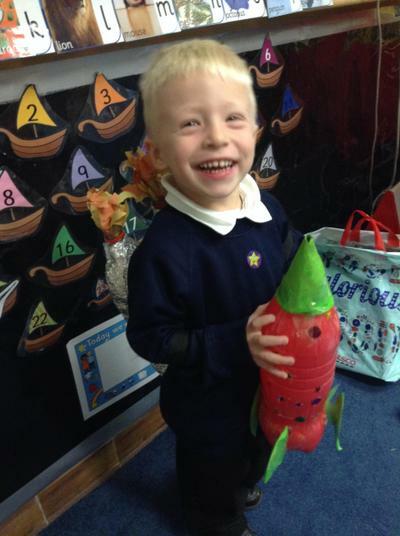 Morgan shared his fabulous drawing of an Alien- he talked about the different parts of the Alien and pointed out the shapes that can be seen. 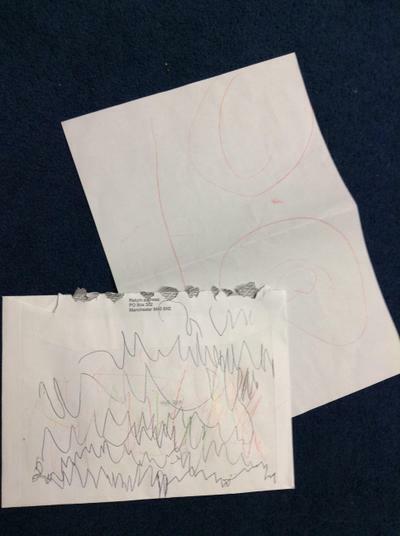 Grace decided she would write to an Alien and produced some Alien writing – creating different patterns. 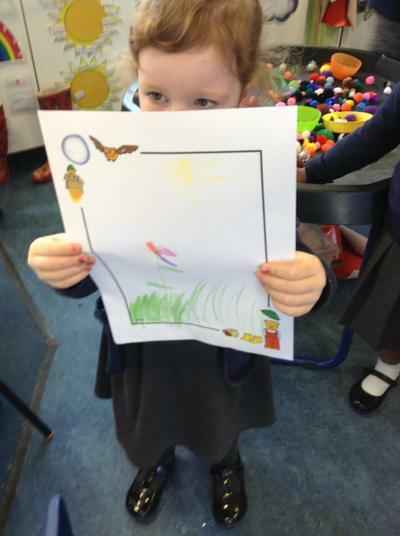 Aaliyah shared some of her special baby pictures with us - we really enjoyed looking at these. 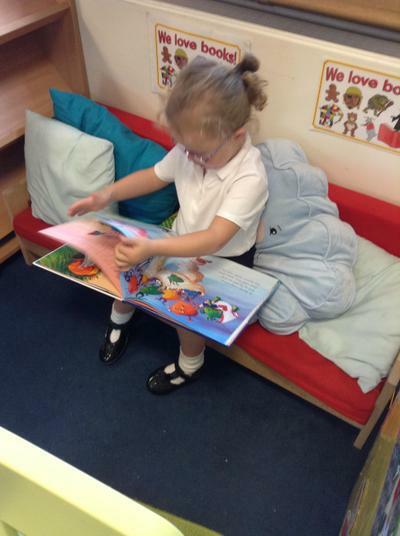 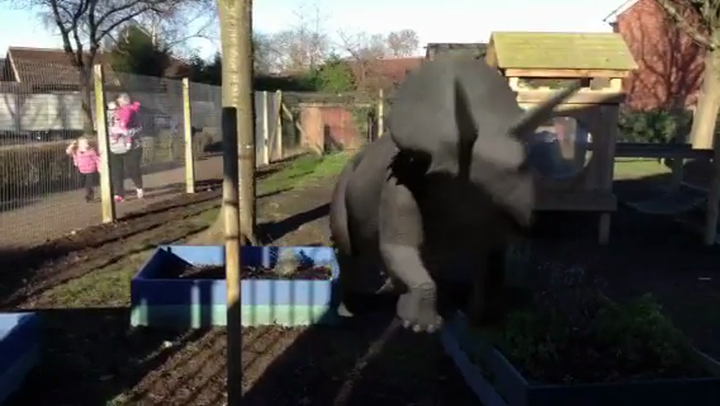 We could not believe how much Aaliyah had grown! 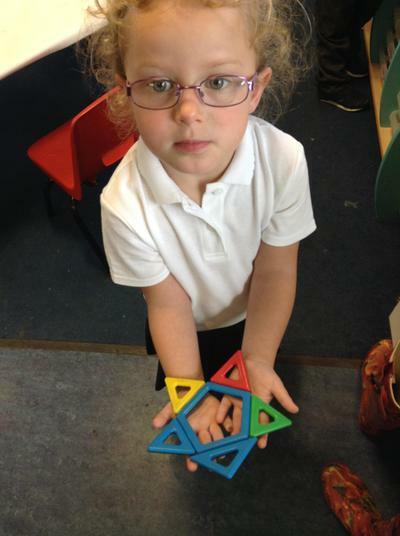 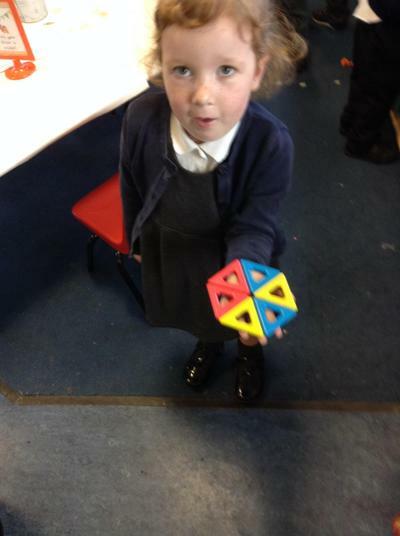 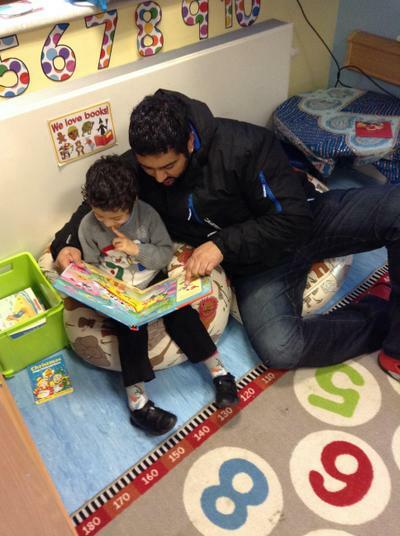 Please keep sharing your Home Learning with us-we love to hear about it.